Supplement or not to supplement? As new parents we count heavily on our pediatrician’s advice for the right protocol to keeping our children healthy. As far as supplementation recommendation, it is important to realize the average pediatrician may only receive an average of two and a half hours of nutritional training during their four years medical school. Many will say supplements aren’t necessary as long as your child maintains a balanced diet. However, with our lifestyles, we know how difficult that can be and eating healthy may not be enough. Nutritional researchers are finding the nutrients in conventional foods are being robbed by our modern agricultural practices with the use of chemical fertilizers, insecticides, herbicides and fungicides. They are finding foods grown on the same land year after year rob the soil of critical nutrients. Plants tend to become less healthy as they struggle to cope with deficient soil and are becoming susceptible to insects, mold, fungi, viruses, weeds and bacteria requiring more chemicals. It’s a vicious cycle. In our modern world it is virtually impossible to obtain the nutrients we need from diet alone even when we eat healthy. Supplements should be used in addition to eating healthy and are not an invitation to eating a poor diet. However, all supplements are not the same. Many vitamins marketed today are synthetic. They are filled with additives, fillers, binders, lubricants, colors and preservatives. These synthetic forms of vitamins may introduce harmful contaminants and allergens and can interfere with the body’s ability to dissolve and absorb the nutrients. Cost does matter. Cheap ingredients usually suggest the product is not of high quality. Because the supplement market is unregulated it’s important to seek manufacturers who use quality ingredients along with good manufacturing practices. Move your child’s nutritional pathway in the right direction by having them eat “real” living organic food and taking high quality vitamins. Empower yourself by keeping up with research and talk to your physician before adding nutritional and health supplements. Your child will thank you with the gift of good health. 5Phases is dedicated to a healthy and organic lifestyle for babies. We develop products that minimize harmful exposure to chemicals, giving baby the best start possible. For more information, visit our Facebook page or online @ www.5phases.com. Plan on getting pregnant, folate or folic acid and what’s the difference? According to Chris Kresser L. Ac there is a big difference and the two are commonly used interchangeably. Many medical professionals would even argue the two were the same. So what’s the difference? Folate, or vitamin B9, is a general term for a group of water soluble B-vitamins. It occurs naturally in foods while folic acid is the synthetic form of folate. The chemical synthesis of folic acid was non- existent until 1943 and became a mandatory food fortification in 1998 due to the overwhelming evidence of neural tube defects in newborns. Unfortunately, researchers have found that the excessive consumption of folic acid in fortified foods may be directly related to the increase in cancer rates. Folate intake is essential for good health and is well known for its role in preventing neural tube defects in newborns. Women planning on becoming pregnant should consume 800-1200 mcg per day for several months before conceiving. Of course, folate from food in its natural state is best. Some excellent sources come from calf and chicken liver, romaine lettuce, spinach, asparagus, turnip greens, mustard greens, parsley, collard green broccoli, cauliflower, beets and lentils. Chris recommends women planning on becoming pregnant should consume between 800 and 1200 mcg of folate per day for several months before conceiving. Supplementing folate (not folic acid) may be required depending on dietary intake. Of course, it is always is important to take high quality supplements. Refer to Chris’s website on brands he recommends as well a consulting your healthcare practitioner. sedentary lifestyle are the real issues facing our children today. detoxification, nutritional supplementation and holistic modalities including homeopathy, naturopathy, osteopathy, chiropractic and acupuncture. 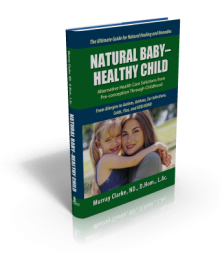 Parents will gain an intimate understanding of how to select and apply these methods for their child’s benefit and good health. I’ve read Dr. Clarke’s book. His passion, dedication and quest for knowledge in what causes ill-health in children are apparent. With a reputation that continues to grow in the community, even local MD pediatricians find themselves referring some of their own patients when they are unable to help them with the standard pharmaceutical treatments. It is clearly understandable why he is one of the most sought after homeopathic pediatricians in the Los Angeles area. Remedies for your childs cold, naturally! With the dreaded cold season upon us its nice to have some ammunition to be prepared. If your child has a cough, encourage him or her to drink plenty of water to thin and expel the mucus. Eliminate foods that create mucus such as dairy, sugar, junk food, and processed foods. Homemade organic soups are always a good idea when treating a cold. Chicken soup made with onions, garlic and ginger help raise immunity and decrease inflammation and hot barley soup reduces phlegm. Once your child is hydrated with all that nutritious homemade soup, chest and back percussions with a cupped hand helps loosen phlegm so it can be expelled from lungs. It’s a good idea to keep the bedroom moist at night with a humidifier. However, not all humidifiers are the same. According to Kathleen Ward Brown, ScD, research fellow with Harvard University’s Exposure, Epidemiology, and Risk program, cool mist humidifiers essentially create acid rain by sending mineral water droplets into the air where as the steam humidifiers send gas by boiling the water leaving behind the heaviest mineral particles. Who wants acid rain in their child’s room? Go with the steam humidifier. *Vitamin C enhances immune function and has anti- inflammatory properties. immune function. It also helps with growth and repair of tissues in the lungs. *Zinc based lozenges help reduce infection and inflammation. *N-acetylcysteine (NAC) thins phlegm to make it easier to expectorate. *Eucalyptus or tea tree oil can be added to vaporizer or warm mist humidifier for a calming effect on the respiratory track. *Licorice tea has antibacterial properties. *Menthol lozenges made from peppermint can be used as a cough suppressant. *Garlic has natural antibacterial properties. *Echinacea/Goldenseal combination enhances immune function and dries up mucus. *Elderberry helps boost immune system and shortens life of cold. Pregnancy is an exciting time. What mom doesn’t want to do everything they can to insure the health of their baby? Well it turns out Mom’s have a tremendous amount of influence over the health of their newborn, even before they give birth. The study included over 1,000 young pregnant women (18-35) and followed their baby’s health until they turned 6 months old. Moms in the study took 400mg/day of DHA fish oil during their pregnancy. Researchers didn’t look at the effects of food sources of omega-3, and in some instances, the baby’s health information came from personal accounts given by the moms. It is important to take note that the dosage levels of fish oil were incredibly low; in fact, the amounts used were actually lower than most recommended dosages. Pregnant Women are typically cautioned against excessive seafood consumption during pregnancy because of an increased risk for exposure to toxins like mercury. Fish oil is not a safe guarantee against this risk. For this reason it is important to take only high quality supplements. Additionally it is important to recognize that researchers neglected to look at omega-3 intake from food sources. The study fails to address mom’s total omega-3 levels during and after pregnancy. It would be nice to know these levels because mom is baby’s sole source for omega-3. While these results appear to be encouraging, it is important to remember one study is seldom enough to warrant a change in lifestyle habits. Mothers can empower themselves by keeping up with research and talking to their doctors before adding nutritional and health supplements.